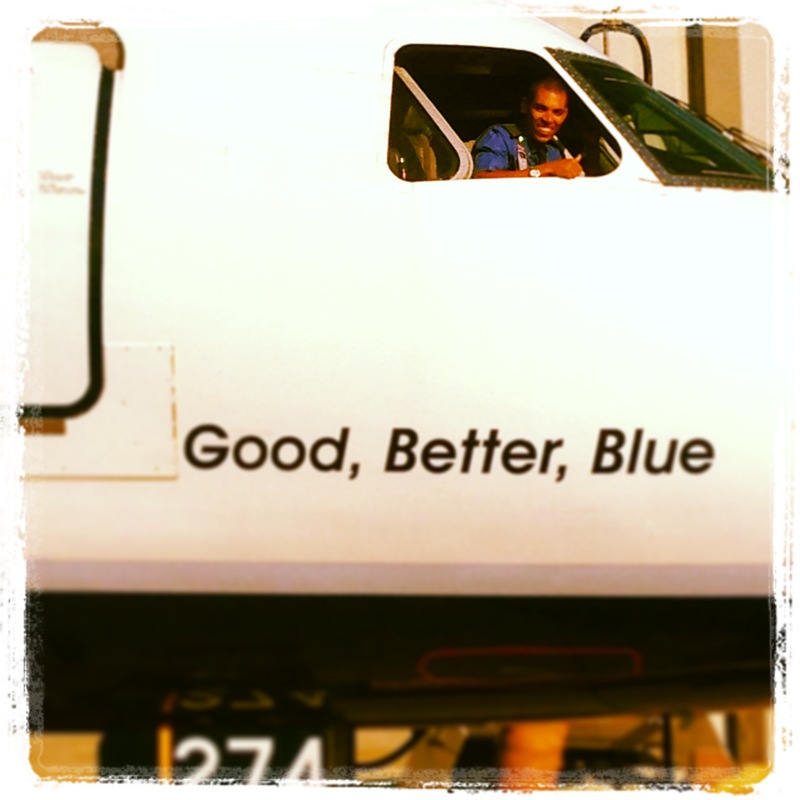 How was your transition from training/instructing at ATP to your present flying job? It couldn’t have been smoother. I started flying ATR’s down in Puerto Rico with American Eagle. The ATR was just a big Seminole, a really big Seminole. I was fortunate enough to get to fly the islands down there and it was the most beautiful, fun, and, challenging experience of my life. Some days it was shooting the “Banana Hut” visual approach into Dominique, which consisted of yanking and banking through a mountain range with the radar altimeter showing us 500 feet above the hard stuff, only to see the runway on short final. Other days, it was hard IFR approaches into Tortola aka Beef Island. All they had was an “off the field” NDB. (I wonder if these young guys will even know what an NDB is?) The missed approach had you climbing in the hold around the mountain so you got pretty good at using an ADF. I remember in training at ATP thinking to myself, “I bet I will never have to do a VOR arc in real life once I get to the airlines…” Well there I was 3 years later getting cleared to join the arc into Santo Domingo… Everyday down there was something different but everyday ended up on a beach somewhere….best time of my life. ATP’s standardization was structured exactly like the Airlines. I didn’t have to worry about how to run checklists and make callouts during training because ATP had me already prepared. I could focus my time on systems and limitations…(and socializing with the more attractive members of our crew). What kind of aircraft make up your fleet and which one do you fly? 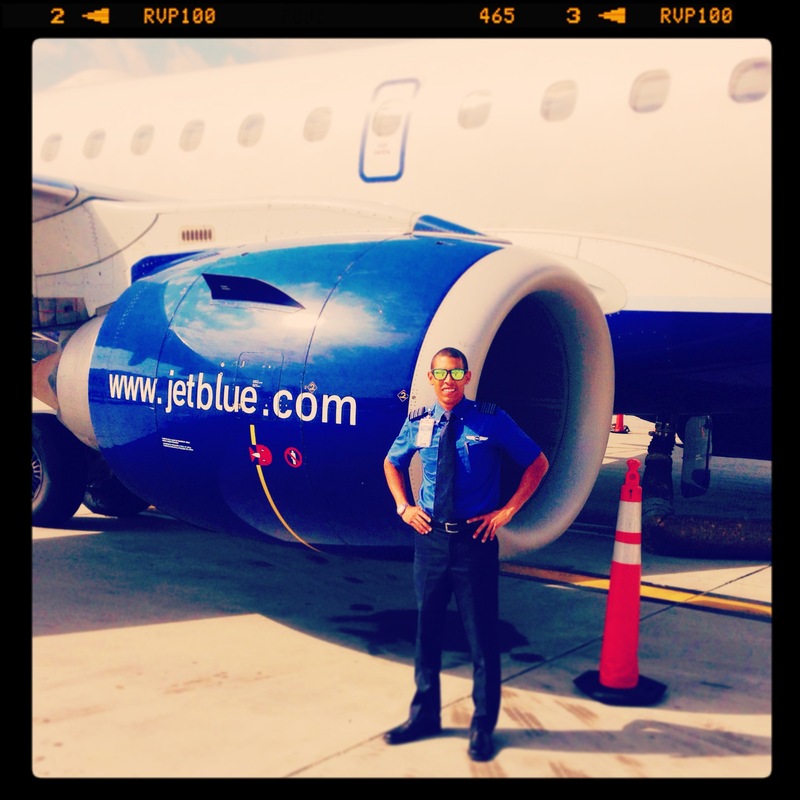 Well I’m currently with JetBlue and we operate Airbus A320/321 and Embraer 190’s. I’m on the 190. What an awesome airplane! JetBlue opted for the dual HUD’s (Heads Up Display) instead of autoland for CATIII approaches. It’s something else to be hand flying down to near zero/zero conditions. What sort of routes do you fly? I’m BOS (Boston) based and if I get to chose, I go as far south as I can get. We do a ton of Caribbean flying and that’s what I love. SJU(San Juan) and STT (St. Thomas) turns are fun because you can literally see the airport on climb out before you are talking to departure. But I’m on reserve this month so I go where they tell me. Sometimes it’s Bermuda and sometimes it’s Buffalo. But I’ve got a hard line (non-reserve schedule) for August. I do quite a few TPA overnights which is where I live. It is always fun getting paid to go home. I do a lot of flying through JFK next month which means more money waiting out EDCT (Expect Departure Clearance Time) and TMAT (Target Movement Area Time) times. What kind of pay are you making? I make $50 an hour. But at the end of the year I get a six thousand dollar bonus and 2nd year pay is close to $80. 3rd year in the right seat and you are knocking on the door of a $100 (close to $100k per year). Being on reserve in Boston has been a blast. I spend most workdays at Fenway Park having fun and waiting for my phone ring. But I love when I get activated. First stop, coffee shop….that’s fuel. Then you run down to the crew room to “socialize”. That’s my favorite part. Then I head to the gate to meet the crew. 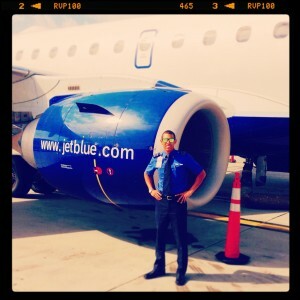 Awesome crews here at JetBlue. Everybody is happy to be at work. Captain flips a coin to see who does the walk around. Then we push buttons for 10 minutes or so, getting ready to go. Hopefully during that time we get a kid who wants to see the cockpit and we bring him or her up front and let them do the fire test or something fun. I make a quick PA (Public Announcement) to the customers telling them “don’t worry, I’m younger then I look;)”…Next thing you know we are pushing back. Flying with the HUD is like playing a video game. Everybody will tell you, auto throttles make you lazy but man do I love them. Enjoy the office view for a bit and before too long you are briefing the approach and starting down. I use to love making my students do vertical descent planning at ATP, now the MCDU (Multipurpose Control display Unit) does it for you! I always hope for 200 and 1/2 mile weather on the approach so you can have a little fun but a lot of days it just the plain old visual approaches backed up with common sense. A little advice for the guys starting out….click off the AP (Auto Pilot) every once in a while. Do some hand flying. You never want to lose your stick and rudder skills. Plus it’s just fun. Don’t be that guy who disconnects at mins on a clear, blue, and a million day every time. Either way landing never gets old. We have a 5000 ft Runway here we put 97k lbs of an airplane on. It’s exactly like doing short fields in the 172. Don’t float. Call ops when you are clear to make sure the gate is open. Call the hotel when you park to make sure the van is waiting. Try and knock out a quick workout before it’s time to go explore a new city with your new friends. Rinse and repeat. What is a good example of a great experience you have had while working there? I love this job…too many to count. What I really love is the travel opportunities…. Like this 20 hour JAX layover I picked up so I can come hangout with Bottomley and Castillo (best friends to this day that I made as a student and instructor at ATP). Or maybe last night when I just decided to go to DC for the night, just to grab dinner….just because you can. Me and Castillo have been meeting in Central America to surf since we started…then out to Colorado to snowboard. I’ll take my golf clubs with me on 30 hour layovers and go play a round. Or maybe go surf on my 24 hour San Juan overnight. My life is like man vs food. I just travel the world eating in different places. I have been putting my GOPRO to good use lately so that has been fun. What is your wait going to be before upgrade? 3 1/2 years on the 190 and you can call me captain;) but get this, my pay rate will then be around 170 per hour. You can turn that into almost $200,000 per year if you want to work a bit. What opportunities for advancement do you have there? Rumors are for wide body jets to fly to the Deep South. That’s where I want to be. But per our current fleet plan, I want to eventfully move to the West palm area as an airbus captain driving to work (making $200 per hour). I’ll bid trips down to South America from FLL and enjoy my 18-20 days off at home playing golf and surfing. That’s the way to do it Chris!